Available in Ivory, Black, Brown, Blue and Red (Confirmation Edition). Burgundy . 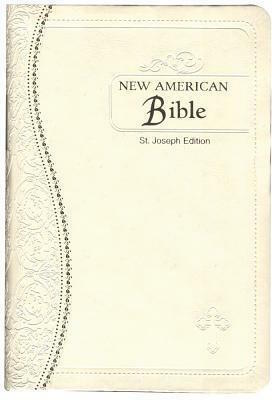 The popular Medium-Size Gift Edition of the St. Joseph New American (Catholic) Bible Revised Edition from Catholic Book Publishing contains the complete Old and New Testaments, many helpful aids for easy Bible reading including new maps, full-color illustrations, and Family Record and indexed pages. The beautiful and elegant features of this St. Joseph New American Bible Revised Edition include supple material, blind embossing, foil stamping, precise stitching, and gilded gold page edges to provide an exquisite and unique package for the Word of God. Note: The Bible readings used in the current missals & lectionaries & LOTH use an older version of the NAB translation that has now been updated in all the new NAB Catholic Bibles currently being printed. For this reason, this NAB Bible will be close (but not exactly word-for-word) to the readings you will hear at Mass. It is not possible to purchase an older NAB translation to exactly match the Mass readings, because they are no longer in print.